The most popular new form of cardiovascular exercise in fitness facilities today is Elliptical Crosstraining. 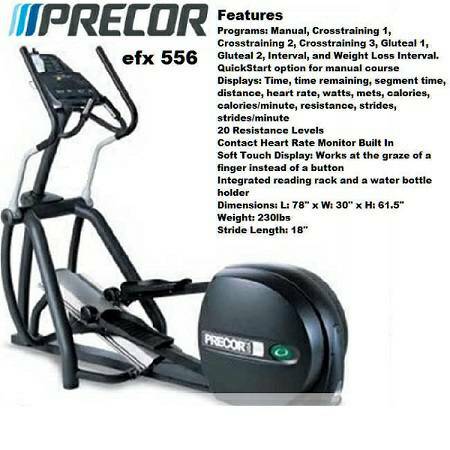 The Precor EFX 556 features a no-impact, forward or reverse elliptical stride coupled with upper body moveable arms, that lets you adjust resistance for cross training benefits. The Precor EFX 556 allows you to stride smoothly while holding the handrails or moving your arms in natural sync, with or without hand weights. 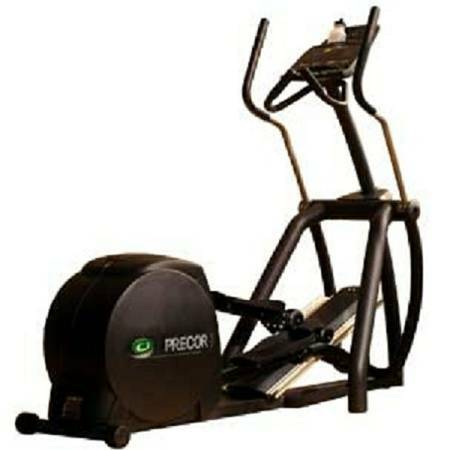 The Precor EFX 556 provides excellent aerobic conditioning, muscle involvement, range of motion and lower rates of perceived exertion than on traditional exercise machines. Quick Start: Lets members begin exercising immediately. A single push of the Quick Start key activates the Manual Course. Manual Course: Allows user to adjust resistance level at any time. Cross Country Course: Features preprogrammed resistance changes in varying intensity levels. Hill Climb: Features preprogrammed resistance changes in graduated intensity levels. Interval Course: Lets user define intervals and duration for one-minute segments. Weight Loss Course: Provides 28 minutes of pre-set intervals. Readouts: Time, time remaining, segment time, distance, heart rate*, watts, mets, calories, calories/ minute, resistance, strides, strides/ minute. Upper Body Handlebars: Functioning in unison with the adjustable resistance of the EFX stride, the handlebars accommodate variety of hand position letting exercisers vary the workout and avoid muscle fatigue. The ergonomic design of the handlebars encourages good posture and proper technique. Smart Rate: Using Polar heart rate technology, Smart Rate* shows at a glance the users target training zones, based on age and body weight. During the workout, tri-colored LEDs indicate the user?s high and low limits, as well as the person?s ideal range for weight loss and cardiovascular training. Ramp: The EFX ramp allows for the patented, forward and reserve elliptical stride and enables users to maintain the correct upright body position. Fixed at a 25 degree angle, the ramp is optimal for the widest range of users and involves- gluteals, hamstrings, quadriceps, and calves. Frame: The simply designed yet exceptionally stable steel frame easily accommodates vigorous exercise and freedom of movement for users of all sizes. Double powder-coated steel construction is extremely resistance to the corrosive effects of sweat and moisture. 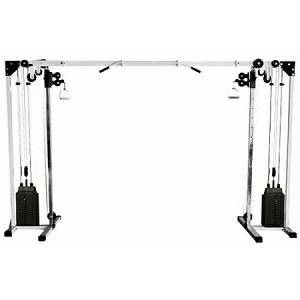 Resistance: Just like the popular EFX546 the EFX556 offers 20 levels of resistance, each of which affects both the upper and lower body action simultaneously. The advanced eddy current brake design ensures consistent resistance calibration between units. Double Step- Up Flywheel: The uniquely effective EFX stride is made possible by our patented, reliable drive system. The rear drive with ramp forward design ensures stride path that stimulates the natural gait pattern and lowers the risk of over-stride. Foot pedals glide easily and silently on sealed bearing polyurethane wheels. Electronic Features: For a total body workout in a class all its own, members will look to the EFX556. Its control and readouts provide valuable information in exceptional, clarity, letting members work smarter with the Precor Total Body Elliptical Fitness Crosstrainer. Versatile programs and convenient features such as Quick Start maximize the total body conditioning of the EFX556, and provide variety and challenge for users of all fitness levels. Smart Touch Key Pad Technology: Controlling and monitoring your workout has never been easier than new Smart Touch display. The EFX556 Smart Touch display incorporates soft touch control, 10 numeric keys, intuitive keystroke sequencing, and multiple feedback options. Large LEDs and accompanying graphics are combined for exceptional clarity and user-friendliness.